It’s that time of year again. 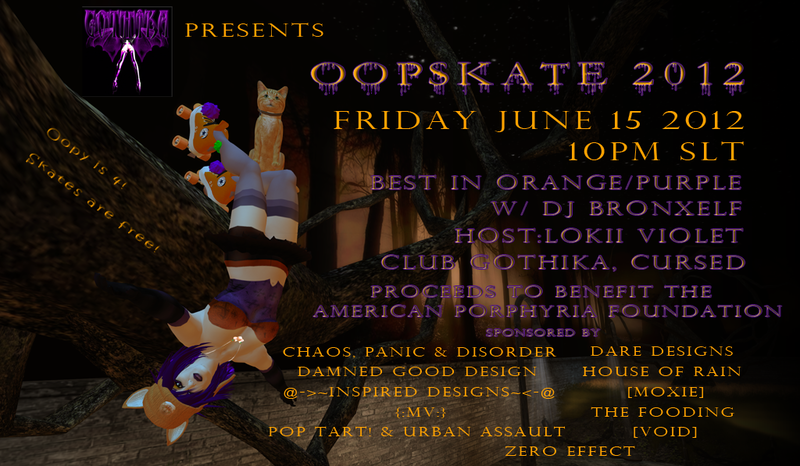 Club Gothika is getting ready for Oopskate, the annual blowout birthday bash for a real life cat. But Im getting ahead of myself. I should explain. One of my cats (RL cats, that is) has his birthday on June 15. Every year on that day, Gothika throws him a goth/industrial/ebm roller skating party. Despite the fact that I don’t think Rupert can roller skate, we continue to do this year after year. Well it’s June again, and once again, all proceeds from Oopskate go to charity. This time, we’re donating all proceeds to the American Porphyria Foundation. The colors of this event are orange, purple and black. (Oopy is orange, porphyria is associated with purple, and black is well, black. All purpose goth color, don’tchaknow.) The contest is best in purple/orange (both, or either) and the prize is a giant stack of gift cards from sponsoring stores. The party begins at 10pm SLT and will go on until everyone decides to go home. Skates of course, will be provided for everyone for free if you dont have your own. Come on out and wish Oop a happy birthday (he’s four!) and let’s raise some cash for a good cause. This entry was posted on June 8, 2012 by bronxelf. It was filed under Gothika and was tagged with American Porphyria Foundation, charity, Club Gothika, Gothika, oopskate, Oopskate2012, Second Life, SL. Pingback: Fluid: Bent’s Hula (plus Oopskate!) « The Ego Co.